Primedice Dice Games Review – Scam or not? Today we will be looking at Primedice.com. Before you are able to access their website you need to choose a username, no need for passwords or anything, just a username. Once you have chosen a username (Username should be below 13 characters) you will then be redirected to another tab wherein you can choose to provide your email or password; you can continue without providing this sensitive information. After you have gone through those windows, you will then be redirected to their homepage. They only offer one type of Dice Game. This type of dice game is similar to some online casino websites out there today. Good thing that you get to have free BTC to play with your new account. This is great because you do not need to think about depositing real money just to try things out. 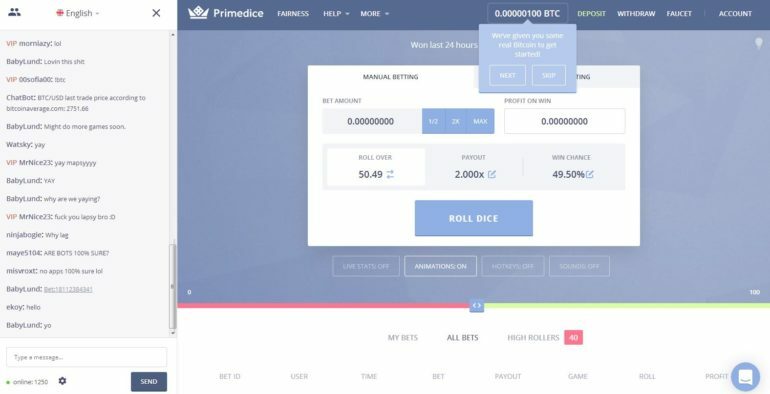 Primedice.com will provide you 0.00000100 BTC as goodwill; with this, you are able to try out the dice game yourself. Please be advised that the credit that they will provide you is real BTC where you can actually use it and multiply until you are able to withdraw it. You start the game by choosing to “ROLL OVER” or “ROLL UNDER” by clicking on either of the ones displayed. This means that if you choose ROLL OVER, all draws that would be over 50 means that you win. If the dice goes below that then you lose your wager. The minimum bet would be 0.000000001 up to your maximum Bitcoin balance. 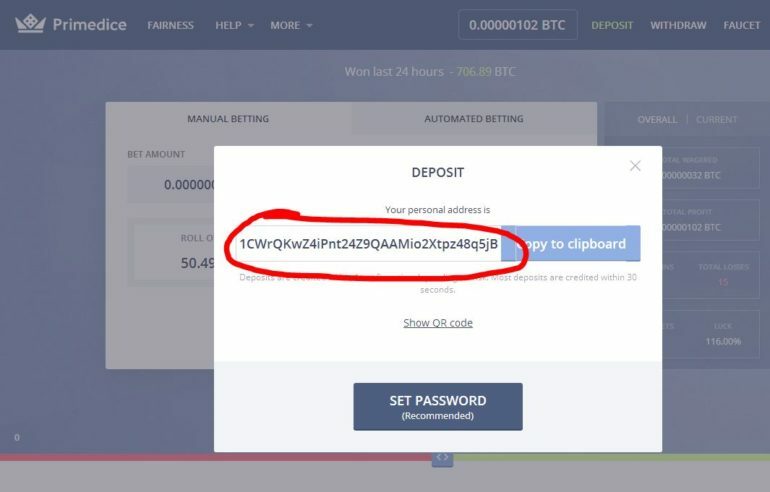 When you click on the Deposit button you will be provided a personal address wherein you are able to deposit Bitcoin to use in playing their Dice Game. Deposits are credited within 1 confirmation depending on risk. Most deposits are credited within 30 seconds. 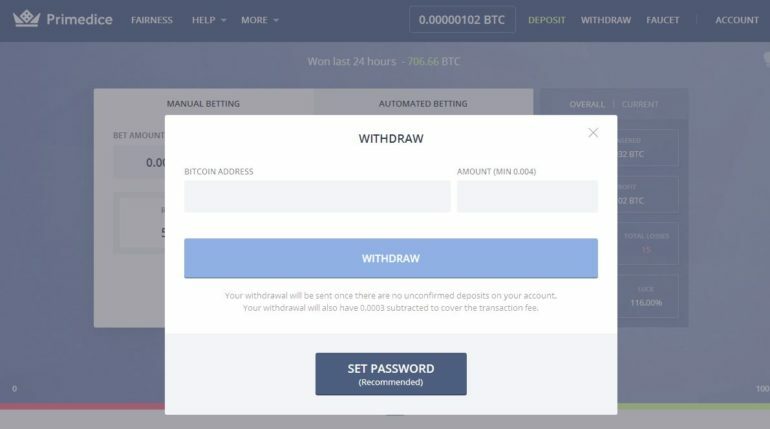 If you want to withdraw all your winnings, you need to make sure that it is above 0.004 Bitcoin for you to be able to withdraw this. In addition, withdrawing Bitcoin requires you to have a password for your account. This is because they need to make sure that you, the owner of the account are the one withdrawing the balance available. Enter your Bitcoin wallet address into the space provided and click on WITHDRAW to transfer funds. Your withdrawal will be sent once there are no unconfirmed deposits on your account. Your withdrawal will also have 0.0003 subtracted to cover the transaction fee. The website is simple as you are not greeted with useless games that clutter all around. You will only be able to play one game and that is DICE. They have different features that you want to look into yourself like the LIVE STATS, HOTKEYS and of course their Live chat box where live chat is available to all logged in accounts. The only missing feature would be the automated system that some websites have today. Having an automated system would make it easier for players to just sit down and relax and watch their Bitcoin numbers rise. All-in-all, Primedice.com has a really awesome Dice game to play with.